This may not be the case everywhere, but here we avoided some serious freeze injury on our 3 year old trees. These satsumas are going on 4 years old, so next year is the year we hope to harvest these. Some of these fruit are pulled off the tree this year to allow the tree to focus on vegetative growth. Leaf miners are starting to emerge. Usually our first flush is safe from leaf miners but they can be a problem at the end of the first flush and every flush thereafter. If you had frost damage and your trees are flushing again, you may want to go ahead and make a treatment. Imidacloprid drenches last about two months. Micromite and Ari-Mek are also labeled to control leaf miners if you are having issues with mites as well. If you do make a foliar application of anything, try to wait until all your blooms are gone as to protect the bees. Mining trail from leafminer fly. Egg is laid on leaf. 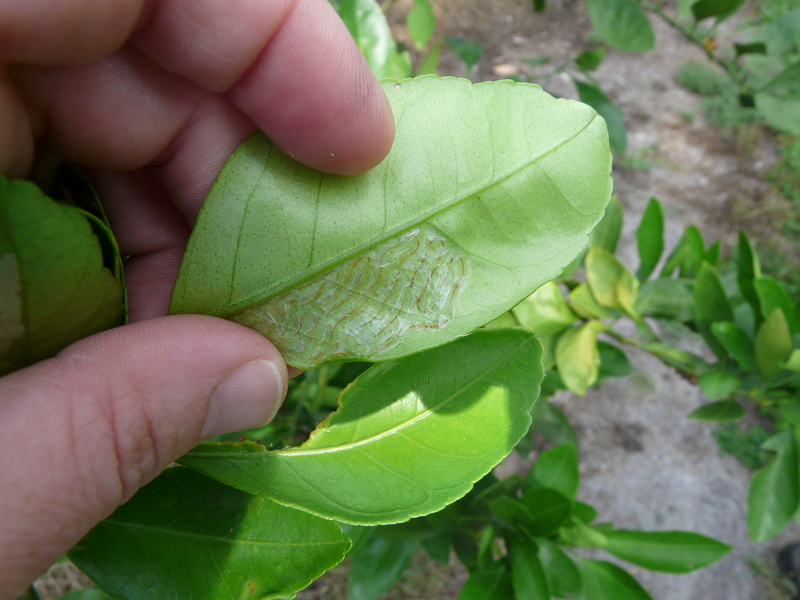 Larvae hatches and goes under leaf cuticule where it mines, curling the leaves and comes out to pupate. This one came out where my thumb is. 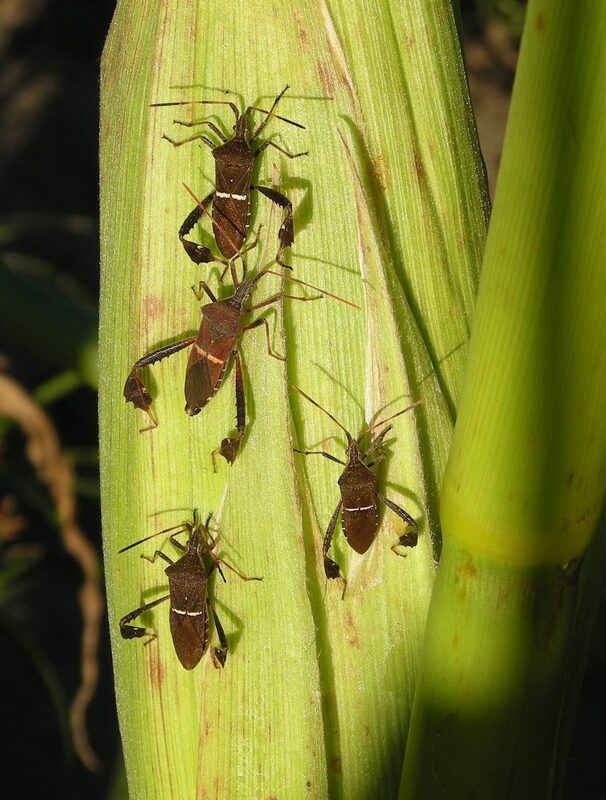 A second insect I have been seeing is the leaf footed bug or what many call “stink bugs”. They can damage fruit and cause them to drop from the tree. Now they are feeding on young blooms and shoots. I see these insects on a variety of things from muscadines, cotton, soybeans, peaches, plums, and blueberries, etc. They tend to congregate on certain trees. 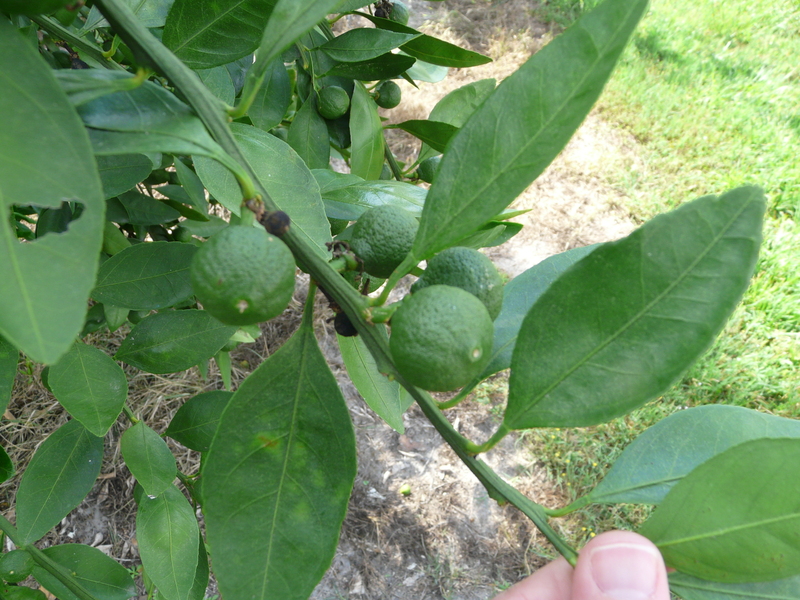 In general, I do not think these are a major pest of Florida citrus but they look like they will be a problem in satsumas because they damage fruit. Again thoughts are no control is needed at this time unless you just have them throughout your grove. If needed you may want to treat certain trees where they tend to congregate.